Expand your Website’s Reach to a Growing Number of Mobile Users by Going Mobile Responsive! What’s the best way to scare off your prospects? Having a stale, static, amateurish website. Your website is your online storefront, and if you won’t treat it seriously, your prospects won’t take your business seriously. From the time the visitor lands on your website you have only SECONDS before they decide to stay on your website and engage in your content or bounce and go find another website. You cannot afford to overlook the importance of intelligent design with high quality content. 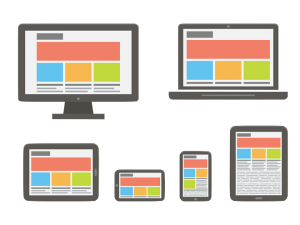 What is Mobile Responsive Web Design? At HY-Viz Marketing, we offer various types of website builds. However, we specialize in building customized, responsive websites based on the WordPress platform. This means we will customize your website based on your specifications. And because it’s responsive, this single version of your website will load perfectly on all devices: desktop computers, laptops, smartphones, and tablets. Why Build a Mobile Responsive Site? Your immediate gains: Studies show that 72% of smartphone owners made a purchase from their tablet-based local search. If your website won’t load properly for tablet and smartphone users, they won’t be able to learn more about your business or buy your products online. Your long-term gains: By 2014, mobile Internet users will outnumber desktop users. By investing in a mobile responsive website today, you are preparing your website and your business to respond to the demand of the future. 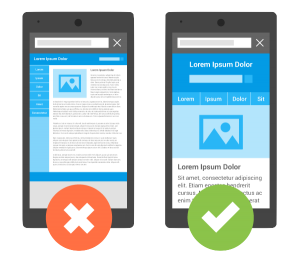 Eliminate lost opportunities and sales by choosing a Mobile Responsive Website Now! WordPress is an amazing content management system (CMS) and is very customizable. It’s SEO-friendly and is easy to use. You can effortlessly upload content on your own if you want to. WordPress and the largest open source web design platform in the world and has more features and “add on” functionalities than any other design platform. If you want to only build your website once and wish to have 100% assurance that it will remain up to date with the ever changing online times, then you want your website built on the WordPress CMS design platform. Installation, Configuration and Customization – We will install and configure the latest version of WordPress on the web server as well as generate your File Transfer Protocol (FTP) and CMS access. Based on our consultation with you, we make sure that an appropriate WordPress layout and design is chosen conforming to the intended purpose and function of your website. Graphic Design and Mockup – Following content and design analysis, we will provide web design mockups (for custom websites) and source relevant images and strategically embed these on your website. We make sure these images are visually engaging and will complement the overall aesthetics as well as the written content. Other services like Contact Form Setup, Email Installation and Configuration, Website Backup, Migration, and Installation are also included. Don’t turn off your prospects. Make a great first impression with a professional and mobile-responsive website. Send us a message now or call us at 618-698-7139. Increase Traffic, Engagement, Customers, Revenue, Profits, and ROI with HY-Viz Marketing!